Family-friendly gites with heated pool near Mont St Michel.. - Les Moulins. 3 Bed House sleeps 8. Les Moulins. 3 Bed House sleeps 8. Ground floor has a large, comfortable open plan kitchen / dining / living area. The well-equipped kitchen has an electric oven and a gas hob. The utility room behind the kitchen has a microwave, fridge / freezer, washing machine and dishwasher. The dining area has a table and chairs seating 8. Living area has 2 large sofas, French and English TV (Free Sat) DVD player, CD/Radio system, selection of board games and books. First Floor: Bedroom 1 with double bed, Bedroom 2 with two single beds and one bunk bed, family bathroom having a bath with shower over. Second floor: A large bedroom with king size bed, en-suite bathroom with shower. The private patio area has a table, chairs, parasol and a barbecue. Access to shared pool heated mid-May to Mid-September and Games room. Wi-Fi. Located in the quiet hamlet of Folleville less than 30 minutes drive to Mont St Michel, beautiful beaches. Supermarket and boulangerie only 2km away. Les Moulins Farmhouse sleeps 8, Hirondelle Cottage sleeps 5 and our Studio Apartment sleeps 2. Set in grounds of 1 acre with a heated swimming pool, sun loungers, pool cabin, boule pitch and parking space. Les Moulins and Hirondelle have their own private patio areas with BBQ. There is a games room with a full sized pool table, dart board, Playstation 2, TV/DVD facilities and a selection of DVDs. There are bicycles of various sizes which are suitable for all ages. All three properties have well equipped kitchens, open plan living areas with French and English FreeSat TV, DVD and Stereo facilities. A full size cot, Travel cots, high chairs, stair-gates and bed-guard are available for use in both the houses. Greetings from Brittany. My name is Alison and together with my husband Malcolm, we own and look after three beautiful holiday homes in Brittany, France. I'm a former Assistant Head Teacher and I taught Food and Catering in England for over 25 years. Malcolm offers Battlefield Tours. We are very proud of the warm welcome and high standard of accommodation we provide for all our visitors and we would love to have an opportunity to welcome you to Folleville. If you have any questions or if I can help you with anything, please let me know. I'll be delighted to help. Alison. toilet, shower, En-suite bathroom on second floor. Pool shared only by the guests in our 3 gites. Pool area is behind a locked gate, has perimeter and water-surface alarms, making it very safe for children. Pool open between mid-May and mid-September. Non smoking and no pets. All linen is provided (including pool towels) please bring your own towels to take to the beach. Electricity, water and gas are included. Outside: Garden and facilities are shared by our 3 properties. There is a 10 x 5m in-ground swimming pool which is heated and open between Mid-May and Mid-September. It has a laser alarm system and is set in the beautiful garden area which is a locked, gated area for added security. There are sunloungers with cushions, tables, chairs and parasols. The Pool cabin/changing room has a WC and washbasin. There is a Boule pitch. Car port for 4 cars. Bicycles of various sizes for all ages, 3 cycle helmets, 1 bike with child seat fitted. Games room has pool table, Playstation 2 and large selection of VHS and DVD's. For those of you interested in History, Malcolm is availabe to guide you around the D-Day beaches. We thoroughly enjoyed our stay at Les Moulins. Alison and Malcolm were very accomodating (we were 4 adults, a toddler and two babies) and were also understand when we accidentally broke a chopping board and an item of crockery. Kitchen was very well equipped which I was grateful for as the nominates chef for the week. I’d definitely stay there again given the chance and heartily recommend the place. Brilliant family holiday home with great facilities. A real home from home! I would highly recommend this property, situated in a beautiful and peaceful location but within easy access of lots of local tourist attractions. The property had everything we needed and some extra touches that made it a great home from home. The children loved having the use of a swimming pool and the games room was a great hit with the older two boys. I found the property to be really clean and tidy and well presented when we arrived and Alison was very welcoming and helpful. I wouldn’t hesitate to recommend this property to friends and family, and we hope to return again in the furture. 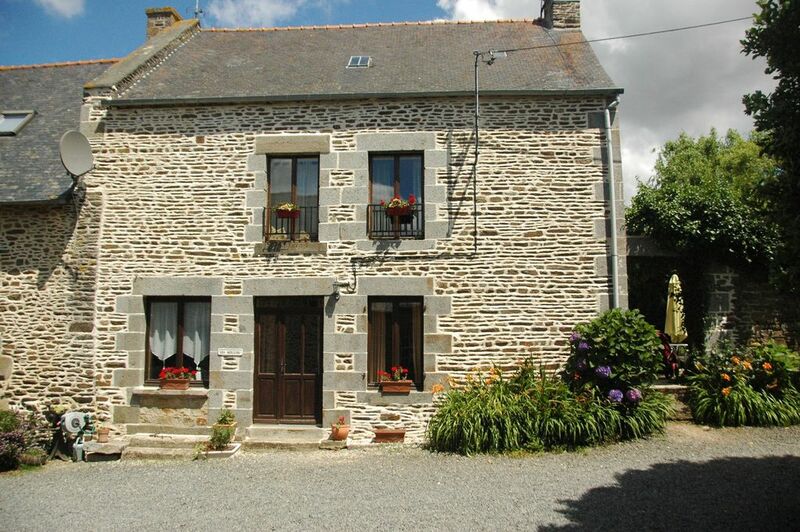 We wanted to be near Mont St Michel but there is so much more in close proximity to this cozy former farmhouse. With bedrooms on two levels we slept comfortably. The kitchen was well equipped and the facility provides a lovely pool, bikes and a game room so the children were happy when not touring. Alison and Malcolm are congenital and helpful hosts. We hope to visit again. In particular, the cutlery drawers were dirty, the cutlery and kitchen utensils needed rewashing before we could use them, there was a large stain on the carpet on the landing, the skirting boards were tatty and covered in dust as were many other parts of the property, the settees smelt of dog and cigarettes. There was an exposed cable in the dressing area of one of the bedrooms and it looked scruffy and unfinished. There is a patio area to the side of the property which we did not use as it involved going out of the front door, instead of having a garden attached. We missed having a garden. Although the pool was supposed to be heated and the daily temperatures hit 30 degrees, the children found the pool too cold so we only used it once. There were no grounds we could use and that was something we missed. Unfortunately there doesn't seem to be a facility to post pictures here, as I have some which would explain things better. Thank you for your comments although they do contrast starkley with the opinions of guests who stayed in the same gite before and after your stay and also guests who were with us - in our other properties at the same time. I highly recommend staying at this beautiful house! Alison and her husband were very kind, helpful, and made sure our stay felt like we were at home. The house is located in a very peaceful area and only a short drive away from Mont St Michel and surrounding villages. The pool was the kids favorite. We had an amazing time. We loved everything about Les Mougins - the house was great and had everything we needed, and the children loved the pool room and swimming pool. Alison and Malcolm were most helpful, and the location is great for exploring the region. Highly recommended. If you would like to combine your holiday with a little piece of history, we offer a bespoke, guided tour service. Malcolm is an historian and although his specialism is that of war studies/battlefields, he will create a visit/tour to suit your requirements. Sea is just 25 mins away, beaches 40 mins and the beautifully manicured beaches of Dinard and Granville are 45 mins. Mont St Michel is 20 min drive, the most visited attraction in France. Forest de Ville Cartier is10 mins away. It has a lake with miniature electric boats, pony rides, also several high wire assault course for children of varous ages and for adults. St Malo Ferry port is 45 mins. Dinard airport 50 mins. Caen 1hr 15 mins. Cherbourg 1hr 30 mins. Le Harve 2 hours. Rennes airport 1 hour. You would need to hire a car if you fly. Antrain, St Ouen la Rouerie 5 mins, both have bars, shops and restaurants. Cancale is a great fishing village specialising in seafood restaurants 40 mins away. Go Karting 40 mins, Great track! Rennes 45 mins. Fougeres and Avranche 30 mins. Large supermarkets, restaurants, post offices and banks are only 5 mins away. Doctor 2 mins away. Notes on prices: Prices for the property are calculated on a nightly price basis according to the length of stay and season of the year. Please note: The open air swimming pool will normally be open and heated during the summer months (Mid-July to Mid-September) only.